“Long-range thinking over generations, this is what characterizes us as a family- run company”, points out CEO,Walter Sennebogen, as he explains the new investment in the Wackersdorf location. On the existing factory premises, by the end of 2014 a new production hall will be constructed with a total useable area of 4,000m2, including a roofed-over material delivery zone and additional break rooms and office space. The objective is to relocate all welding tasks and to enlarge the roofed- over finish assembly areas. At the cornerstone laying ceremony, the acting district administrator of the Schwandorf district, Joachim Hanisch, and Wackersdorf's mayor, Thomas Falter, recognized the loyalty and the bonds that the machine manufacturer has to the region. Almost 25 years to the day after deciding against a reprocessing facility and the step into an uncertain future, today both politicians are convinced that a company is better positioned in the region than ever before. This is primarily due to the pioneer, Erich Sennebogen Sr. who at the time was one of the first who dared to take the step to Wackersdorf, stated Falter. 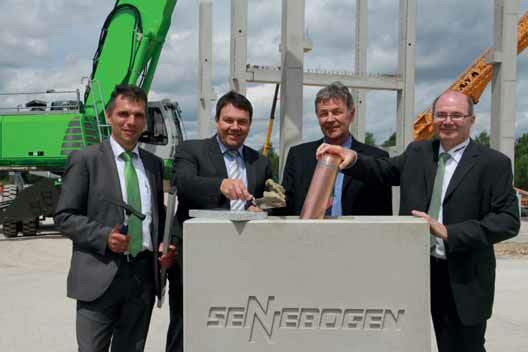 Together with plant manager, Alexander Scherer, Sennebogen, Hanisch, and Falter the cornerstone to conclude the ceremony. A cylinder with current documents, a set of coins, a newspaper, the current corporate brochure, and also a photo of employees was professionally immured in the cornerstone that weighs approximately 750kg, with the hope that if it possible it would always be the cornerstone of a flourishing enterprise. A spacious 1,200m2 uppercarriage welding shop will be built in the new steel construction hall. A separate painting area with wash bay and drying zone on a total of 550m2 is directly adjacent. Thus in the future the uppercarriages can be painted directly after they are welded.The new steel construction hall will be equipped with a modern welding gas extraction system with efficient heat recovery and hall crane systems with load bearing capacity up to 20 tonnes. In the future, the large machines and special machines will be prepared for shipment In the second nave of the hall, in the new finishing area. Previously in some cases these machines, with operating weights up to 100 tonnes, had to be set up and dismantled outdoors. A large storage area and office and break facilities round out the extension. The objective of the investment is to offload the previous assembly stations and processing stations, and to provide room for further expansion and more efficient work. The new building's energy supply is ensured for the future through a modern wood-chip heating system and a large-area photovoltaic system. Thus over the long- term, the existing buildings on the Wackersdorf site can also be heated in manner that is carbon neutral.